MGoBlog had a Picture Pages post today addressing the 3-3-5ness or lack thereof of Michigan's defense this year. As I rewatched the game, I saw similar problems but didn't quite know how to explain it. 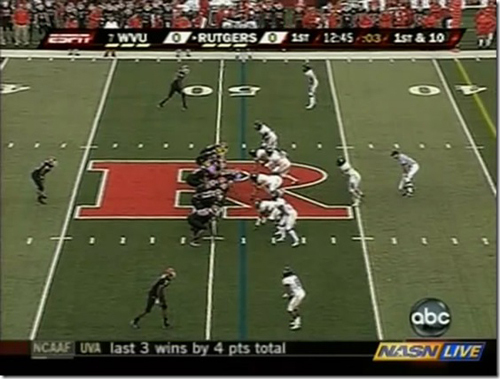 What I saw was Penn State frequently getting a blocking advantage with motion and designed cutbacks. That's beside the point, however, and I think Brian explains Michigan's schematic problems really well there. I did see one thing in his comparison to a similar WVU defense that he failed to mention--and it's something I actually loathe to bring up because this horse is dead and I'm tired of kicking it. One of the reasons Michigan can't show this front is because they can't/won't play man defense. WVU is showing a six-man rush with man coverage on the receivers, the middle linebacker on the running back, and presumably, the safeties covering the tight ends if they release upfield (otherwise, they're just giving cover-2 help over the top). With Michigan's insistence on playing zone coverage, the linebackers/spurs/bandits are unable to attack like this because of play action. Since each player has a responsibility in the passing game, attacking the line of scrimmage aggressively on a hand off will open up gaping holes in play action. Michigan's linebackers have to wait until they're certain that the running back has the ball before they can attack the line of scrimmage, at which point, the offensive linemen have been given a free release to the second level. Not to mention that when the linebackers start flowing down the line, it creates gaps in zone coverage on the backside of the play, something that Penn State saw a lot of success on by sneaking tight ends and full backs into the flat. Michigan is a passive three man line with guys you can easily single block (but get to double if you want) and linebackers who are living a nightmare. it's largely because Michigan physically can't attack the line of scrimmage more aggressively while also requiring second-level defenders to be responsible for the passing game. This, of course, comes back to the Read and React principle that you expect your players to be able to perform, because not all zone plays get gashed by halfback runs. However, with only a three-man defensive line, Michigan is giving up far too many free releases to the second level where, when players have had a chance to react to the play, they'are being blocked by free releasing linemen. Rogers, Floyd, Avery, and Talbott can all cover for at least limited amounts of time (Avery might be the best cover corner on the team that's currently healthy, about which more this week). Never did they get blown off the line and completely lose coverage [Ed. Whoops, wrong here re: Floyd]. As such, Michigan can blitz more often. I think part of the reason Michigan hasn't blitzed as much as we'd all like to see is because, as porous as the zones are with eight defenders, they'd be even more open with five or six. I was arguing for, essentially, the same as above: with the ability to cover receivers one-on-one, a defense has more opportunities and flexibility in the blitzing game. Michigan can't bring more than three or four blitzers--Michigan's "blitzes" are equivalent to a four-man defensive line--because they are terrified of being beaten in the passing game. As such, Michigan has settled for these three-man rushes in the hopes that the zones behind them will hold up, which they haven't. This defense is broken and more bothersome, it appears that Robinson is fine with the status quo. This is the first week where people are actively coming after him rather than Rodriguez, who has taken the brunt of the media's force this year. If Robinson doesn't change anything this week against Illinois, Michigan will lose in the same fashion that they've been beaten the previous three weeks.